This is a studio portrait of private Virgil Barnes (on the right) and another soldier during World War I. The image is believed to have been made in France, since the original postcard carried the printed inscription "Carte Postale" on the reverse. After the U.S. entry into World War I, Barnes' national guard unit in Jackson County, Kansas, was activated in August 1917. The unit--Company B of the Second Kansas Regiment--soon became part of the U.S. Army's Company B, 137th Infantry Regiment, 35th Division. After training for several months at Camp Doniphan in Oklahoma, the regiment deployed for France in April 1918. The 137th Infantry took part in the epic Meuse-Argonne battle in late September 1918. Barnes was gassed during the battle, and was hospitalized for a time. After the war, Virgil Barnes pursued a professional baseball career. A right-handed pitcher, he played seven complete seasons at the major league level, primarily for the New York Giants. He had 61 major league wins, with a career ERA of 3.66. His best year was 1924, when he had an ERA of 3.06 and a record of 16-10. Barnes made World Series appearances in 1923 and 1924, including the starting assignment in Game 7 of the World Series. Virgil Barnes was born in Ontario, Kansas in 1897, and was raised in the nearby town of Circleville. His older brother Jess also was a major league pitcher for several years. Two younger brothers, Charles and Clark, received tryouts with major league teams but did not make their rosters. 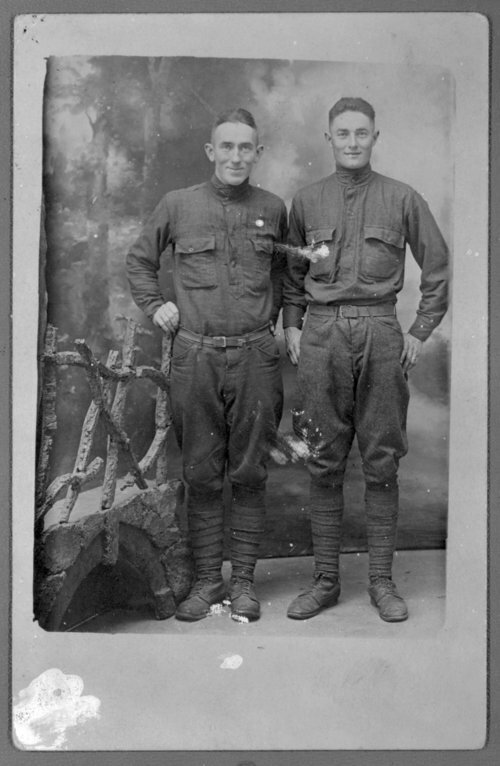 This is a studio portrait of private Virgil Barnes (on the right) and another soldier during World War I. The image is believed to have been made in France, since the original postcard carried the printed inscription "Carte Postale" on the reverse. After the U.S. entry into World War I, Barnes' national guard unit in Jackson County, Kansas, was activated in August 1917. The unit--Company B of the Second Kansas Regiment--soon became part of the U.S. Army's Company B, 137th Infantry Regiment, 35th Division. After training for several months at Camp Doniphan in Oklahoma, the regiment deployed for France in April 1918. The 137th Infantry took part in the epic Meuse-Argonne battle in late September 1918. Barnes was gassed during the battle, and was hospitalized for a time. After the war, Virgil Barnes pursued a professional baseball career. A right-handed pitcher, he played seven complete seasons at the major league level, primarily for the New York Giants. He had 61 major league wins, with a career ERA of 3.66. His best year was 1924, when he had an ERA of 3.06 and a record of 16-10. Barnes made World Series appearances in 1923 and 1924, including the starting assignment in Game 7 of the World Series. Virgil Barnes was born in Ontario, Kansas in 1897, and was raised in the nearby town of Circleville. His older brother Jess also was a major league pitcher for several years. Two younger brothers, Charles and Clark, received tryouts with major league teams but did not make their rosters.